Los Angeles and California’s Central Valley have bad air pollution. Sure, it’s not the 1970’s style pollution that doctors say was like smoking two packs a day, but California is still home to the top five most polluted cities nationwide. 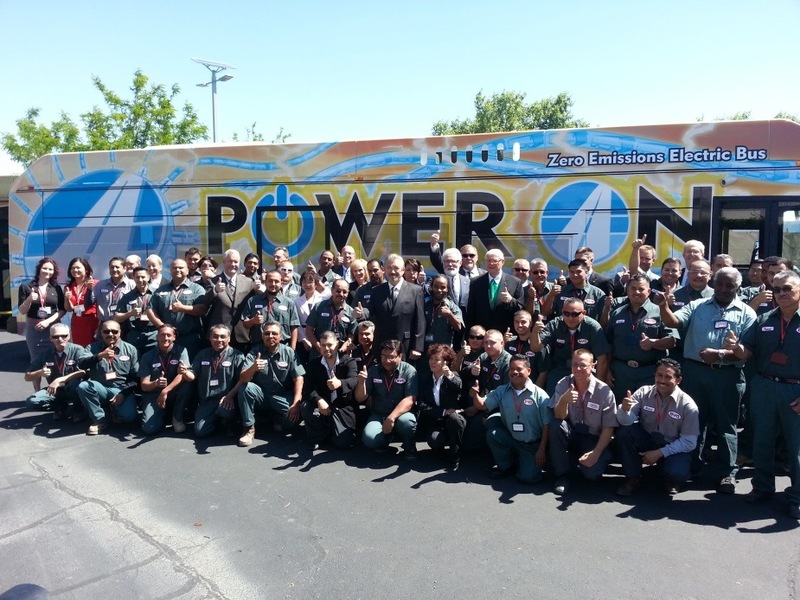 Who: BYD America, Green Automotive, and Motiv Power Systems, three companies that each employ between 25 and 75 employees in California, and work to facilitate the use of electric buses in the state. What: BYD America and Green Automotive manufacture heavy-duty electric vehicles, and Motiv Power Systems builds electric power systems to electrify buses. Where: BYD America is based in Lancaster, Green Automotive is in Riverside, and Motiv is located in Foster City. Why: All three companies are dedicated to expanding the use of clean, cost-effective transit buses, shuttle buses, and school buses in order to benefit the economy, environment, and public health. The most significant offender is the state’s transportation sector, responsible for significant ground level ozone and nearly 40% of greenhouse gas emissions. Indeed, in too many California cities, the city buses and school buses are still powered on diesel fuel and spew harmful pollution into the air – further degrading the already compromised air. Enter AB 32, a program that has created an entirely new way of thinking about transportation pollution and is resulting in powerful alternatives and new companies that offer a different approach to mobility. BYD Ltd., Green Automotive, and Motiv Power Systems – are three companies working to accelerate the growth of electric buses and cost-effectively reduce pollution. BYD Ltd., originally founded in 1995 to build batteries for small electronics, has significantly expanded their portfolio in recent years to include electric buses. 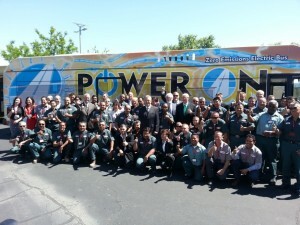 They’ve opened an American factory in Lancaster and have already made inroads in that market by selling transit buses to Antelope Valley Transit and Los Angeles Metro, and recently showcased a new bus that runs up to 24 hours on a single charge. 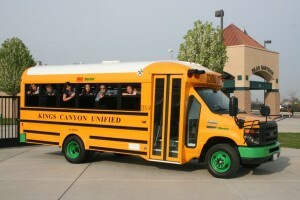 An electric bus installed with a Motiv power system at Kings Canyons Unified. Green Automotive, based in Riverside, is in the process of marketing electric shuttle buses through their Newport Coachworks division. Their All-American built E-Patriot shuttle bus, available for sale later this year, will initially target the market for transporting passengers from hotels to flight terminals across the state, and is actively being marketed to airports. Green Automotive’s vision doesn’t stop there – they plan to lobby for all airport service vehicles and public school buses to be electrified. Motiv Power Systems works with companies to electrify their products by delivering the electric systems used in vehicles. Motiv is helping place school buses and shuttle buses on the market, with plans to put electric delivery vans into action in the near future. 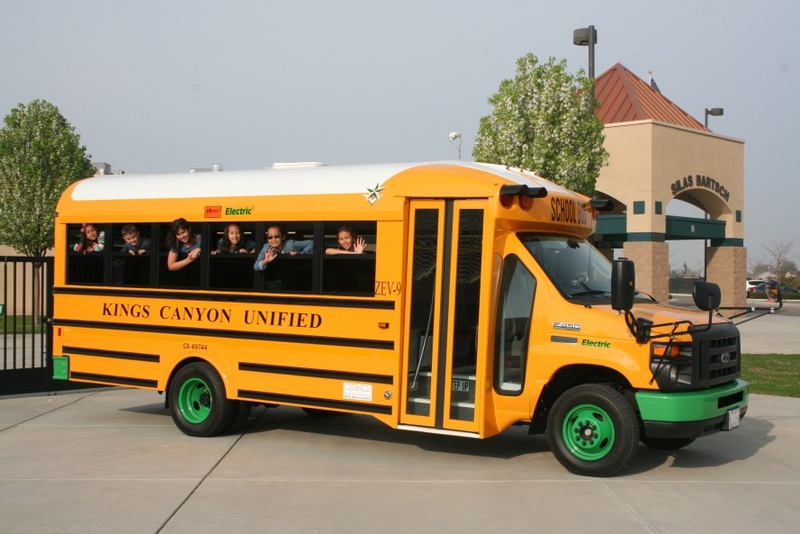 Of particular note is Motiv’s partnership with King’s Canyon Unified School District in the Central Valley – in collaboration with Trans Tech Bus, Motiv has put the first electric school buses in the nation on the road. What do all three companies have in common? They’re cutting the use of diesel fuel and replacing it with electricity – a changeover that cuts pollution while saving money. In some uses, electric buses can save between $400,000 and $600,000 over the life of the vehicle. Presentation at a Governor-attended event of a bus that runs for 24 hours on a single charge. Click image to enlarge. Why are electric buses so important? In addition to cutting pollution where it counts (in our cities, next to our schools, etc), buses generally drive continuous pre-planned routes, coming back to their home base a few times a day. This makes them ideal candidates for electrification. According to BYD America Vice President Micheal Austin, “Each diesel bus that is taken off the road is the equivalent of avoiding tailpipe emissions from 33 passenger vehicles for a year. If this many emissions reductions can be gained from a single partnership, the work that is being done across the company as a whole – as well as from other electric heavy-duty vehicle companies – has the potential to be game-changing.” According to BYD, they have partnered with StanfordUniversity, resulting in over 40,000 miles driven by University transit buses – with zero combustion emissions. Like BYD, Green Automotive, and Motiv Power also see the importance of the electric bus movement. Green Automotive shuttles are designed to transport passengers to airports. BYD, Green Automotive and Motiv are at the forefront of a clean transportation revolution. By making public transit and school buses cleaner and cost-effective for California’s citizens, these companies are creating a triple win for the environment, public health, and the economy. 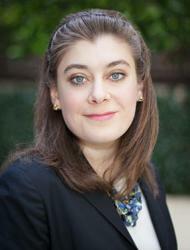 This entry was posted in California, Cap and Trade, Clean Energy, Climate, Electric Vehicles, State. Bookmark the permalink. Both comments and trackbacks are currently closed.